All Tub Studio bathtubs are built as shown in the above drawing. 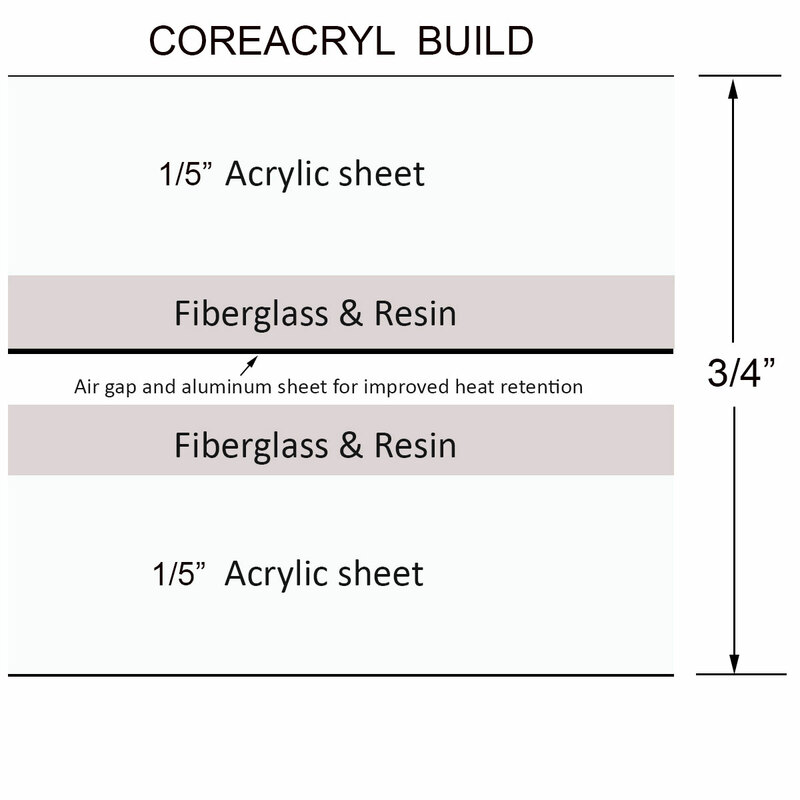 All tubs are built using CoreAcryl. The inner shell starts off as 3/16" pure high gloss acrylic sheet and is molded into the inner shell shape. Added to the inner shell are three layers of fiberglass with resin. A final aluminum heat shield layer is added to the inner shell. The outer shell process is the same, excluding the aluminum foil barrier. Resin mixed with powdered stone is then poured over the inner shell and the outer shell is pressure joined to the inner shell. We take great care to leave a narrow air gap behind the aluminum as this allows that barrier to work correctly and avoid heat loss from the tub. This produces a solid, strong and relatively light weight body with a minimum wall thickness of 3/4". Extra reinforcing makes the tub floor over 1" thick. Unlike many other manufacturers, all of our tubs have slip resistant floors, are cUPC approved and listed and are MA Code accepted.